A kitchen is one of the most important spaces in the home. It's where we cook our favorite meals, spend time with our families, share heartaches over cups of tea and celebrate successes with champagne! Yet a kitchen can go out of date in the blink of eye. With technology constantly evolving and styles updating monthly, your kitchen can become an old, tired room that lacks style before you know it. Today at homify, we are going to see how a kitchen was transformed from an old and dilapidated space into a brand new, refreshed and modern space thanks to design professionals Chichichic. We hope it gives you the inspiration to perhaps transform your kitchen! In these photographs, we can see what a bad state of disrepair this home was in. The walls are old and yellowing, there are pipes all over the place and there is cement and stones lying across the floor. There is no style or interior decor when it comes to this space. This is a kitchen that is in serious need of a renovation! In this image, we can see that the kitchen is in a better state but it's very outdated. There are old yellowing tiles on the walls, which don't work in harmony with the white cabinets or counters. There is no personality or charm, yet the kitchen is meant to be the heart and soul of the home. The kitchen is also very small, with no real natural light. It looks like only one person would be able to fit into at a time! There is nothing modern or trendy about this space. If we step into this newly renovated kitchen, we can see how it's been completely revamped. 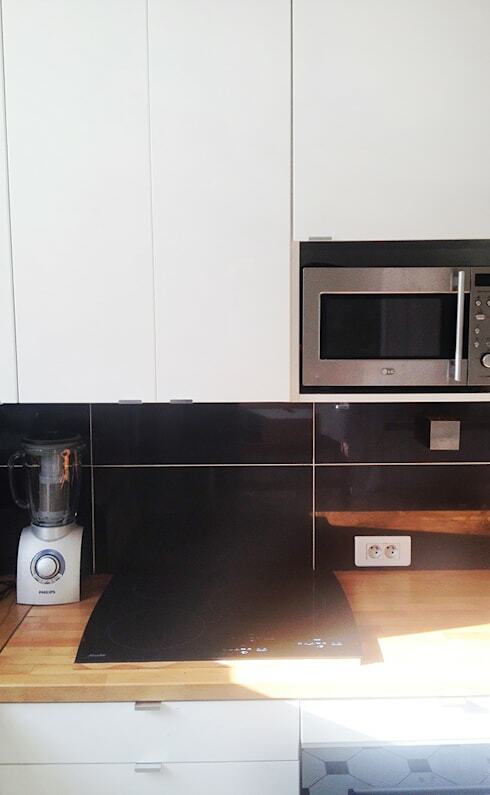 It features sleek white cupboards, wooden counter tops and a ton of charming of kitchen accessories. 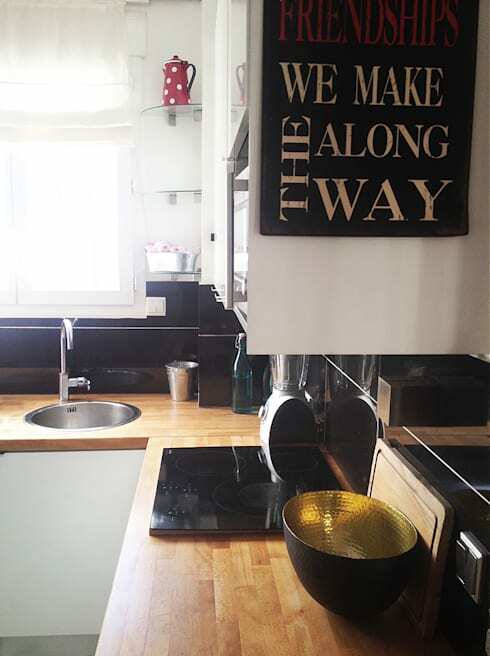 These kitchen accessories, including little posters with quotes on it and modern kitchen appliances, transform this home into a charming, modern and homely spot. Gone are the old yellow walls and boring decor. Your home deserves a little bit of personality and sparkle so don't be afraid to add some picture frames or treasured decor items to your kitchen, which speak to the heart of your family. 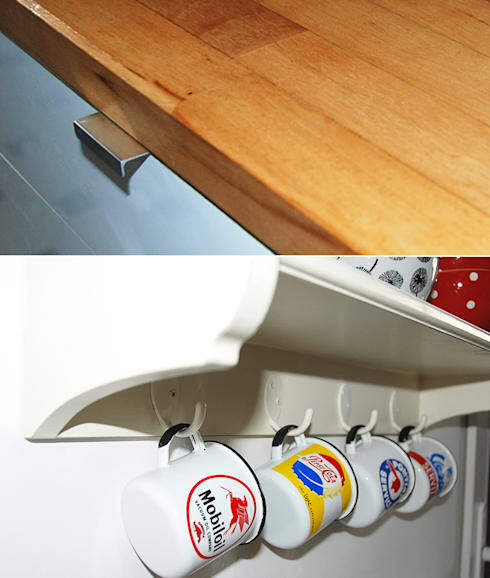 Also have a look at these kitchen accessory must haves. Replacing old appliances with sleek and modern new ones will instantly result in a kitchen evolution. It will also make cooking that much more convenient! Modern technology makes everything that much easier so don't waste any time in investing in the latest microwave, refrigerator or toaster. You'll also see that the designers have gone for dark colours in this space, including dark wooden counter tops and charcoal black tiles. These colours work because of the amount of natural light that flows into this space. They also contrast beautifully with the white cupboards. It's the little details in the kitchen that mean the difference between a plain old space and a homely, charming spot where the family comes together. You can achieve this by opting for glassware, mugs, plates or cutlery that bring a bit of color, personality and vibrancy to the space. Your home should be beautiful but also functional and comfortable. Double up functional items as decor pieces, like the designers have done here. Keep them neatly organized, however. Hang them up on the wall or place them in a glass cabinet where they are out of the way but still on display. If you like this ideabook, you'll love these five fantastic kitchen transformations.